I've been seeing a lot of talk lately about blogging on other blogs. The same questions seem to repeatedly pop up about what makes a good blog and how much time should we devote to blogging. I've been examining the topic for some time now in my Blog Boggled series and I will be looking at some more blog things that bug me this coming Monday. I will be providing some links to some of the other bloggers' posts that I've found just in case you missed them--good stuff if you're interested in making your blog a better blog. For those of you who enjoy Bible studies, I post one each Sunday. I usually neglect to mention this in my Saturday preview, but I thought I would offer this reminder since it's always my least visited post of the week. Even if you don't believe in the Bible or don't like it, I'll invite you anyway. You're always encouraged to comment whether you agree or not. Tomorrow I will be examining on how you can apply the Bible to your life and why it can be beneficial to do so. There were some interesting comments in reaction to my post this past Tuesday about being involved, specifically in relation to community associations, and if you have to deal with this where you live you might want to look back at this post if you missed it. My upcoming Tuesday post will be looking at Michael Jackson. Did you see his concert movie THIS IS IT yet? I'll tell what I think about it. The past couple of Wednesdays I've reminisced about encounters with Rudy Vallee and old cowboy matinee heroes. However, all of my encounters with famous, or somewhat famous, people have not been filled with so much regret as the ones I have related so far. Next Wednesday I'm going to talk about some different types of encounters, this time with some Christian music artists. A whole bunch of people jumped in with their opinions about the Academy Awards this past Thursday. You're always welcome to go back to any debate and put in your two cents. This coming Thursday I'm going to pose a question about something that may on some of your minds: Summer vacations. Come back Thursday and tell me what your answer to my question is. Yesterday was kind of like your English Lit class when you studied poetry. I offered up one of my poems (a song actually) for readers to interpret and it was interesting to see what they came up with. I will be giving my actual interpretation in those comments later today so if you missed it, check it out. I thought it was really obvious, but maybe I was wrong. Next Friday I'll be examining some of the mysterious creatures that may roam our Earth--myths or are they real? Do you believe in Bigfoot? And now for another award! 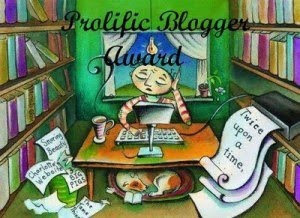 Okay, I already received this one from Carol Kilgore but now Jamara Falconer has given it to me again and, well, not to brag or anything, I do feel like I am a pretty prolific blogger and who am I to refuse Jamara anyway. Thank you Jamara the Nightwriter for this recognition. In keeping with all of the current blog controversy I will not be passing this one on again as I must allot my time to other pursuits. As always, if you haven’t received this award yet let me know and I will recognize you on my site and officially pass it on to you. Kudos on the award! Sounds like a nice rhythm to your posts you have set up, the regular features and all. I know it helps me to blog consistently to have a few regular features to stimulate the ol' blog-head, lol. Saturdays are good days for wrap-ups. I'll have to pop back to yesterday & see your comments on your poem. Not seen the MJ movie - and probably won't. However, would like to see Crazy Heart after Jeff Bridges won an Oscar for his performance. Sounds like we have an interesting week ahead with your blogs, I must say I do enjoy the diversity of them. Can you please pass me on that award to brighten my blog. Most appreciative if you can. Yvonne -- Yes! yes! I'd be delighted to pass this award on to you, because you are deserving of it. Thank you for stepping forward. Sometimes with my blog schedule it's been difficult to figure out who to send it to. On my Monday post I will officially name you and link to your blog. Congrats! on the award. Saturdays are a good day to do wrap ups, or do nothing much but lounge and take naps. I usually lounge the first half of the day, then pick up the pace as the day progresses. I'm pretty useless on the weekends, so prolific is not me!